The EC-0.8BM 3-pole Locking Mini-Plug to Mini-Plug from Sony is ideal for use with your UWP Series Portable Tuner. Box Dimensions (LxWxH) 4.5 x 4.2 x 1.4"
EC-0.8BM 3-pole Locking Mini-Plug to Mini-Plug is rated 4.7 out of 5 by 10. Rated 2 out of 5 by Fernando D. from Short Cable The cable is shorter than the one included in the original system. The technical specification doesn't mention the cable length. El cable es mucho ms corto que el que incorpora el sistema original. La especificacin tcnica no menciona la longitud del cable. Rated 5 out of 5 by Gilbert D from Solid Performance I needed this cord ASAP for a project, and B&H got it to me on time. Works as required. This company is one of the few out-of-area companies I trust. Pretty much everyone else, I want to see their faces when they're selling me something. Rated 5 out of 5 by Javier Garca from Solved my problem I tried using generic cables with the Sony lavaliere microphone I use, but the audio is got sounded like awful and with only one channel recorded. This cable solved that issue. Worth the money. Rated 5 out of 5 by Dre from Perfect This cable does the job well! No loss in audio. And the locking pin prevents the cable from unplugging. Rated 5 out of 5 by Jonathan Yonkers from nie back up I got this as a back up in case I loose the original one. Works like advertized. Rated 5 out of 5 by Daniel Sametz from Good Miniplug for Lavalier Good cable for Sony lavaliere. Do you have the version with two locking mini plugs for the Sony dual channel receiver? I can't find it anywhere. There currently is no cable sold separately with two locking 3.5mm connectors. Out of the Sony duel receiver you either would, connect two cables terminating in Male XLR or 3.5mm, depending on your input device. it is an awesome and very reliable cable. Which end has the lock, and how long is the cable? The straight end is the one that had the lock on the one that I got. Will this cable work on the Sony URX-P2? Yes this cable should work fine. It also has the locking end so it wont pull out accidentally. Will the Sony EC-0.8BM 3-pole Locking Mini-Plug to Mini-Plug work with DSLR camera for audio input? The Sony EC-0.8BM is designed to connect a Sony UWP receiver with locking output connector to the input of a DSLR or similar device with a 1/8 mic input jack. Will this cable work with the Sony UTX-B1 mic? 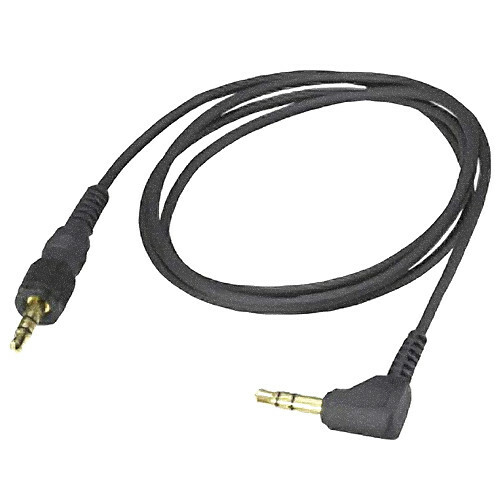 The is Sony EC-0.8BM is an output cable for the UWP series receivers for connection to a device with 3.5mm mic input jack. Not designed to be used with the transmitters.